The 2016 postseason ended the Chicago Cubs World Championship drought of 108 years. In 2017, the Houston Astros captured their first World Series title in franchise history (55 years). This year’s postseason offers the opportunity to several franchises to make history yet again. There are only seven MLB teams who have yet to capture a World Series Championship. Two of those teams are facing each other in the National League Division Series; the Milwaukee Brewers and Colorado Rockies. The Brewers entered MLB as the Seattle Pilots, an expansion team in 1969. They played only one season in Seattle, before departing to Milwaukee in 1970, filling the city’s baseball void left when the Braves departed for Atlanta in 1966. The Brewers have captured only one pennant in their history, 1982 (during their years in the American League). A Brewers team that included future Hall of Famers Rollie Fingers, Don Sutton, Robin Yount and Paul Molitor, took the St. Louis Cardinals seven game in that Series. They have only reached the postseason twice since 1982 (2008 and 2011), prior to this year. The Colorado Rockies entered MLB as an expansion franchise in 1993, alongside the Florida Marlins. While the Marlins went on to win two World Series titles, the Rockies have made the playoffs several in their 25 year history (1995, 2007, 2009, 2017); including capturing an NL Pennant in 2007. The 2007 Rockies team was less memorable as they were swept by the Red Sox, but their roster included the likes of Todd Helton, Troy Tulowitzki and Matt Holliday. The 2018 Brewers and Rockies entered the 2018 postseason in a very unique way. Both teams found themselves tied for their division lead after game 162 and were forced into a one game faceoff with the Cubs and Dodgers. The Brewers win at Wrigley Field not only secured their second NL Central title, but also the first place seed in the National League throughout the playoffs. Meanwhile, the Rockies loss the Dodgers forced them to travel to Chicago where they shattered the hopes of the Northside faithful in a late night, 13 inning victory. Both teams entered the NLDS with very similar resumes. Each have star players, Christian Yelich and Nolan Arenado, who are top contenders for the NL MVP Award. 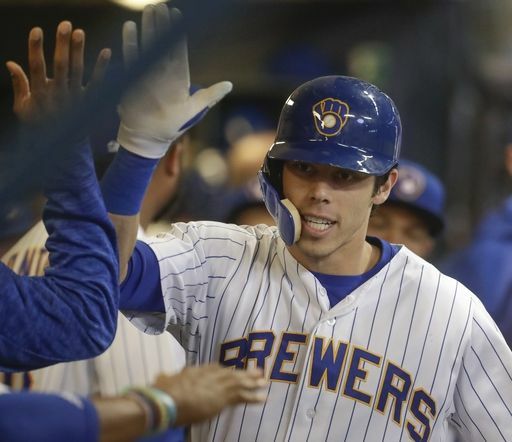 Yelich finished the season in an electrifying fashion, chasing the Triple Crown. He led the National League with a 3.26 Batting Average and 1.000 OPS, along with 36 HRs (4th) and 110 RBIs (tied for 1st in NL with Arenado) Meanwhile, Arenado led the NL with a 38 HRs, accumulated 110 RBIs and finished right behind Yelich in OPS (.935) with a .297 BA. Arenado is also likely to receive his sixth consecutive Gold Glove at Third Base. The Rockies have compiled a powerful trio of All-Stars with Arenado, Center Fielder Charlie Blackmon and Shortstop Trevor Story. Not to mention, a nice pitching rotation with Kyle Freeland, German Marquez and Tyler Anderson, along with veteran Closer Wade Davis leading the NL in Saves. The Brewers have a put together a lineup which includes former members of the Kansas City Royals Championship team, Lorenzo Cain and recently acquired Mike Moustakas. Add in All-Star First Baseman Jesus Aguilar, Travis Shaw and Ryan Braun and the Brewers lineup is among the most dangerous in all of baseball. Concern over pitching depth may be overblown, as Brewers pitchers have held a strong Rockies lineup to only two runs, including a shutout in Game 2 by Jhoulys Chacin. They have relied mostly on the strength of their bullpen, with Josh Hader and Jeremy Jeffress at the backend. Overall, despite to Brewers having gotten out to a two game lead in the series, these teams match up well in so many ways. Consider both teams play in ballparks named after beer companies for which their home cities are famous; Miller Park (Milwaukee) and Coors Field (Denver). Both come from states with storied NFL franchises and the Broncos defeated the Packers in Super Bowl XXXII. If either team were to reach the World Series, they may provide an alternative for Middle America, should the Red Sox or Yankees win the American League. Which AL team would make of their most interesting opponent? The Astros offer a good storyline for either team. An Astros vs Rockies Series would have a regional component, between two franchises from the heartland of the country. An Astros vs Brewers Series would highlight the over half century championship drought of the Brewers against a franchise that ended theirs last season. If the Astros do not prevail in the ALDS, the Indians would make for a great matchup with the Brewers. Two cities located on the banks of the Great Lakes with fans longing for a title. An Indians vs Brewers Series could also be dubbed, the Bob Uecker Series, as the legendary Brewers play-by-play radio personality played the role of Harry Doyle, the voice of the Cleveland Indians in the classic movie, Major League. Regardless of their opponent, this year’s Fall Classic would benefit should either the Brewers or Rockies earn their way there. Can Trevor Rewrite An Even Better Story In 2017?